We are just back from a trip to Scotland to visit my sister and her family. 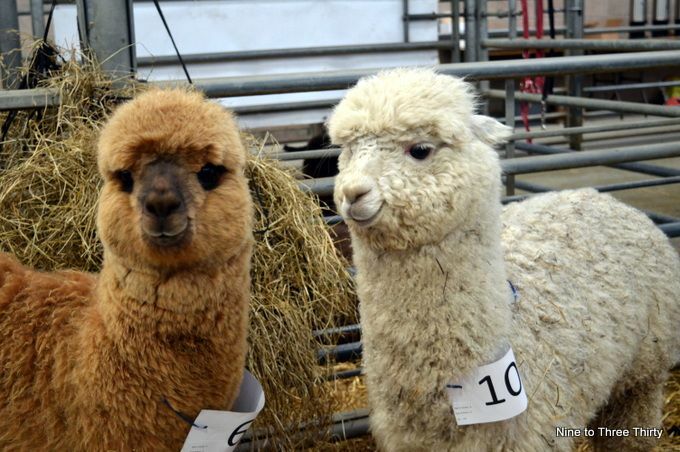 One of the things that had been picked out to do while we were there was going to the Scottish Alpaca Championships. It’s not an event I’d heard of previously, but I liked the sound of it. 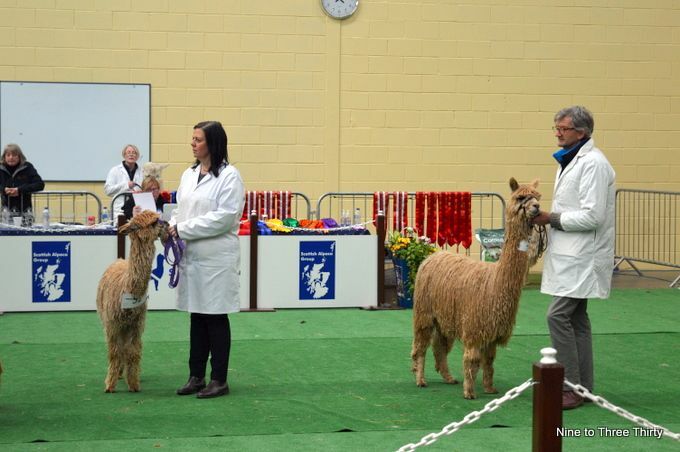 I’ve enjoyed trips to cat and dog shows in the past and I wondered how an alpaca championship would differ. 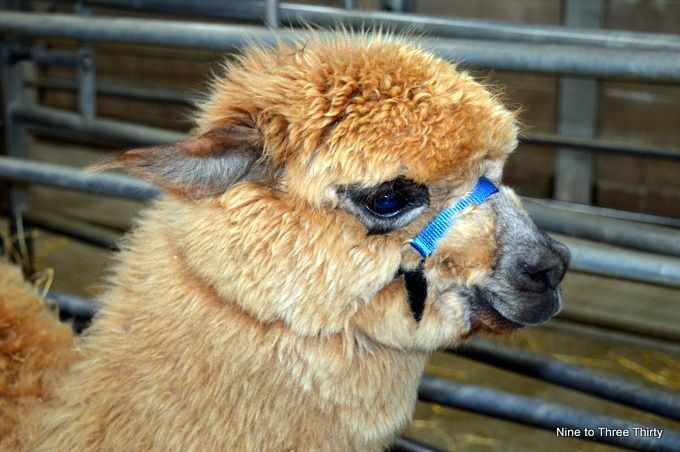 It was held in Lanark at the Lanark Agricultural Centre and was run by the British Alpaca Society. We went in and watched some of the judging to start with. To be honest a lot of it was a bit of a mystery to me: the judge was talking about form, lustre and other qualities and I wasn’t really sure what it all meant. It probably didn’t help that we came in half way through. It did give us a chance to see how much variety in size there was even between alpacas of the same type. Whilst the children settled down to watch some of the judging, my sister and I wandered around the stalls to find out a bit more about alpaca wool. There were ladies spinning, knitting and crocheting and we learnt a bit about that from talking to them. One thing that I found interesting was to feel the texture compared to sheep’s wool (much softer) and to see the effect of natural dyes on the wool like tea bags and onion skin. We also met the lovely people from Teesdale Alpacas and discovered there is such a thing as alpaca trekking. I particularly liked their lovely scarves and we were very taken with the teddy bears made from alpaca wool. We then had a wander round the holding pens for the alpacas and got to meet a few of them. There were certainly some characters amongst them and they seemed like sociable creatures. We were sorry when it was time to say goodbye. I love alpacas, can you believe that the farm next to Joe’s school has alpacas and they once escaped all over the school fields! Bet the kids loved that. They’re such gorgeous animals! I didn’t know there were so many in Scotland. This is very interesting I had no idea that such thing did exist! This is fascinating, who would have thought there would be such a competition. I would have no idea how to judge alpacas either and lustre?! How strange. But they are super cute! I think alpacas are great and there are some in a field not far away from here, much to my surprise. I own an alpaca scarf that my sister in law brought back from S America and you are so right about how soft it is … and really warm. 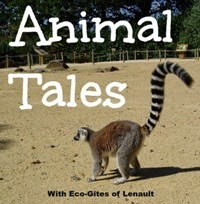 That you for adding alpacas to #AnimalTales, we don’t see enough of them in the linky! Looks like a fun and unusual day out. 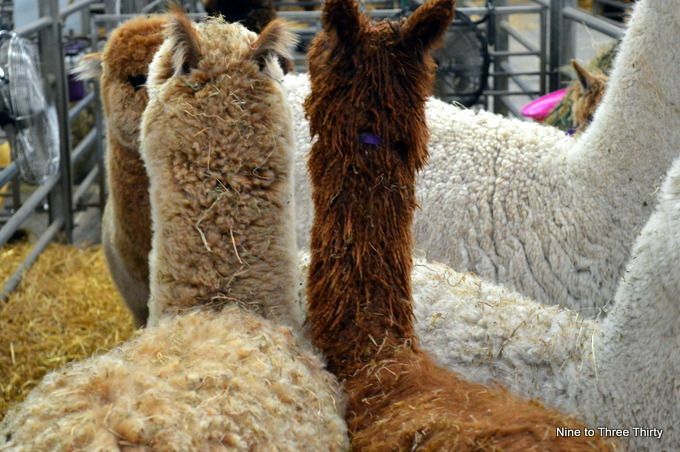 I love Alpacas, and there are a couple of farms near here where we can see these odd but lovely animals – I’d ever have thought of an alpaca competition though, sounds really interesting!